The deadline for Environmental Quality Incentives Program (EQIP) applications is December 15th for 2018 funding consideration. Contact our office for more information! 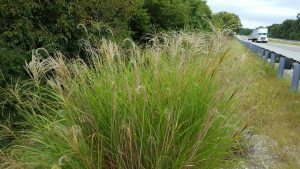 Chinese Silver Grass (aka Miscanthus) is producing seeds right now making it very noticeable. See our fact sheet here. The September board meeting will be tomorrow at 7 am, instead of the usual third Wednesday. 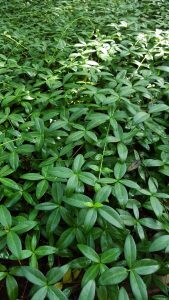 The Knox County Cooperative Weed Management Area (CWMA) is hosting a woodland invasive plant training with Purdue Extension Forester Ron Rathfon on Saturday, September 16th from 8:30 am to noon at the Southwest Purdue Ag Center (4369 Purdue Rd, Vincennes, IN 47591). 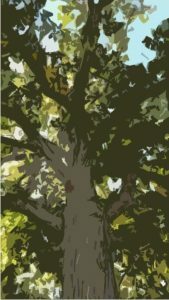 Woodland owners, contractors, nature enthusiasts, and others are invited to attend. Topics will include invasive plant identification, invasive plant control, technical and financial assistance, and a field demonstration. Category II CCHs will potentially be available. For more information or to RSVP, contact Will Drews at willem.drews@in.nacdnet.net or (812) 882-8210 ext. 119. Celebrate Pollinator Week with Native Plants! Join us this Saturday, June 24th at the Historic Vincennes Farmers Market to get some great native pollinator plants from us! 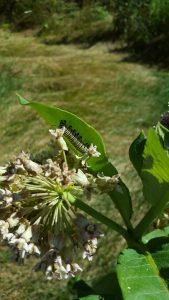 We’ll have over 20 different species of native wildflowers and grasses including Common Milkweed, which is a host plant for Monarch butterflies! 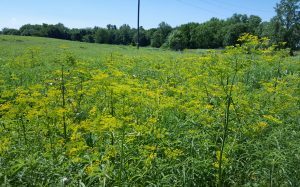 Wild Parsnip contains a compound that can cause severe rashes/burns, so do not touch this plant! See our fact sheet here. May 2017 Board Meeting Rescheduled! Our monthly board meeting has been rescheduled from this Wednesday to this Friday the 19th at 7 am. The Knox County Soil and Water Conservation District (SWCD) is a subdivision of state government and is governed locally by a five-member Board of Supervisors and with the support of Associate Supervisors. The SWCD exists to promote the responsible use, development, and conservation of Knox County’s natural resources and works closely with a wide variety of partners in both the private and public sectors to provide a high level of conservation service to Knox County’s landowners. The SWCD is seeking candidates for the newly created CEO position. This full time position will lead the SWCD’s human and capital resources to carry out the will of the Board of Supervisors in order to fulfill the SWCD’s mission of conserving and restoring Knox County’s natural resources. The CEO reports to the Board of Supervisors and is an employee of Knox County. The Knox County SWCD Board and staff are known for their innovative approaches to meeting the conservation needs of Knox County’s residents, and for their willingness to provide leadership for regional and state-wide conservation programs. Our vision is that the Knox County SWCD will be the recognized leader in natural resource conservation and environmental issues in Knox County and will further its leadership role at the state and national levels. The CEO will play a major role in bringing this vision to life. • Perform other duties in alignment with SWCD mission as assigned by the Board of Supervisors. Applications will be accepted and reviewed until the position is filled, but those received after June 16, 2017, will not be guaranteed consideration. This position requires a satisfactory criminal history background check. See our April Weed of the Month fact-sheet here.